1. Finish December's Grandmother's Choice blocks, and keep up with January's. I managed this one, and am up to date, with the exception of last Saturday's. 2. Sort and cut up box of neutrals and whites. I started this one, but it isn't finished. 3. Sort out my piles of orphans and UFO's. This is done. The UFO's are in boxes and bins, labeled and packed and ready to be unpacked when we finally get moved. 4. Sort and cut all my boxes of coloured scraps. This one is completely done, and then some. All my odds and ends of fat quarters are sorted and folded and put into drawers. All the odd shaped and smaller than fat quarters are now cut into strips, or into squares. Some of the squares are sorted into sets of 5 for a plus sign quilt I want to do, and some are in sets of 9 for a puzzle quilt I want to do. So, all in all, I am really pleased with the goals I met. In the midst of all this was sorting and packing stuff, getting ready to move. It's taking a lot longer than we had hoped, due to the city not being able to make up its mind about what they will let us do for building my craft room in the garage. Poor Matt was trying to deal with them, and everyone he talked to told him something different. So we've finally given it to the builder to handle. In the meantime I've gone through the kitchen cabinets, and cleared all the clutter out. We've been painting and plastering and stripping wall paper, and generally turning our current house into a place that looks like it is in total chaos. Noel was staying with us for the past 6 weeks, and has been a fabulous help to us. He replaced our bathroom sinks. He did all the baseboards and trim around the doors of the main level of the house. He built a railing for the landing on our second floor. We are so happy with all the help he has given us. We are currently in the car, driving him back to Sudbury, where he is working in a theater, as I type this. Once all the painting is done in the house, we'll be able to put everything back together again, and get ready for the real estate agent to take photos and get it listed.. I must say that all the chaos is playing havoc with my patience levels. What a challenge. (sigh). I'm linking up to Judy's Getting it Done post. For February, most of my goals involve moving. But since we still don't have a moving date, and are dependent, at the moment, on slow moving city hall, they will be rather hard to measure. 1. Complete the last of January's Grandmother's Choice, and finish all of February's. 2. Participate in Gail's sew-in date on Feb. 9th, and start one of my Newfo list on that day. 4. Get settled and unpacked. I’ve been plodding along on last weeks’ Grandmothers’ Choice block. It took me quite a while to even figure out how I was going to do it. I finally decided on the starch to turn the seams and then glue baste it down, even on the pieces at the edge of the umbrella, rather than trying to piece that arc. So this is going to be my stitching project for today. \it is all glue basted down, and I can relax, for part of today, at least, and do some hand stitching. I finished up 3 customer quilts in the past week and a half, so there hasn’t been a lot of time for sewing. But I did manage to get 5 more 36 patch squares done. So there is a little bit in the out column. And I got the 20 nine patches for the guild swap done as well. Balance 8.6 yards more out than in. I’ve opened one of the envelopes that came from the Fat Quarter shop, just to see what is in there, but the fabrics are still in the package, so I’m still not counting it in. There is a sew in date coming up at Gail’s in a couple of weeks, so I’ll be opening it, and cutting into them to start a quilt that I’ve been aching to do for years. I have more 36 patches up on the wall. There are a total of 10 now, and I want to do 30. I have about 10 more pairings chosen, so I can work on these off and on through the coming days. I have a couple of customer quilts to finish off in the next couple of days, so that will be my focus. But I can do these when I have to sit down and take a break and rest my legs. I managed to make a few more 39 patch squares this week, so I have a bit more yardage out to count. Balance: 7.2 yards more out than in. As stated before, that added number is going to spike once I actually open and add in the fabrics that I have purchased. Once we move in to the new place, and start unpacking is when I'll count those fabrics. There are a few here, still in their envelope that I might end up using in February, In which case, I'll count them then. Scott and Noel were over at the apartment for a large part of yesterday painting. When I got home from work last night, they were both not quite sure of the colour, They were thinking it might be too much yellow. So I went over this morning to take a look, and I don't think it is too yellow at all. I think it is sunny and happy and bright. 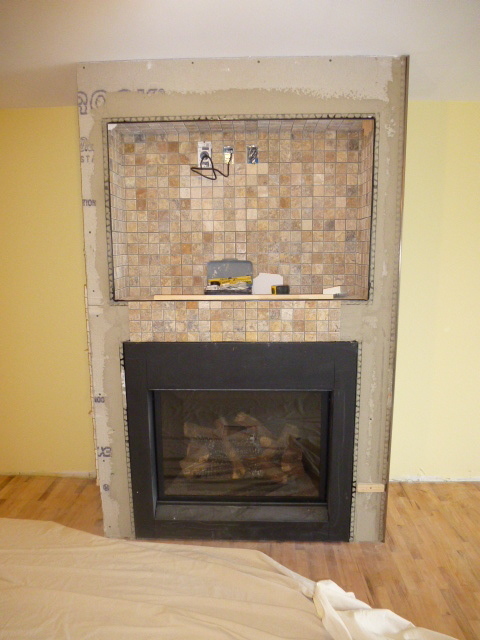 The stone work around the fireplace is coming along well, and it will be darker once the sealer is added to it. And the colour of the walls goes perfectly with the stone work on the fireplace. We have tons of this paint colour. For some reason, we bought 4 gallons of it. So I think, once the studio is done, I'll probably put this colour in there, too. I'm linking up to Judy's Patchwork Times stash report. I'm all caught up on the Grandmother's Choice, Votes for Women, block of the week. Week 19 was called Old Maid's Ramble. This one was a challenge. I ended up ripping out a couple of times, due to getting the triangles either turned in the wrong direction, or in the wrong spot. And looking at the picture now, I just noticed that the brown ones are still turned the wrong way. Oh well, it's staying this way. I was hoping to be able to do today' before going to work, but it is a bit complex, so there won't be time for that. I'm just going to do a little simple sewing on the 36 patch quilt that is slowly growing. I'm finally back at doing the machine quilting. YIPPEE!! I have one of Charlene's on the machine right now. It is a really lovely sampler. The colours and the fabrics are gorgeous. There are roses in her focal fabrics, so I'm doing an all over design called "Climbing Rose" by Lorien Quilting. It feels so good to be quilting again. At the beginning of January, I set myself four goals that I wanted to achieve by the end of the month. 4- sort and cut box of coloured scraps- done. I'm extremely pleased with what has been accomplished, so far. We went over to the new place today to see how it is coming along. It is really looking good. All the kitchen cabinets are in and the sink is in and the back splash tile is up. There is going to be a shelf across that space between the bulkhead and the cabinet, where I will probably put a couple of my small teapot collection. And underneath that bulkhead will be a small glass cabinet that will hold either some more teapots, or my tea cups and saucers. 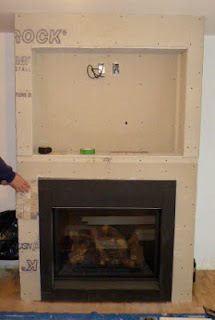 The fireplace is all framed in, and the cubby hole for the TV above it is built. And here is a closer view of the stone tiling that will be going around the fireplace. It's getting closer to being a reality!! We still don't have a firm moving date. It looks like it will be closer to the middle to end of February. I've moved most of my sewing stuff over to what will be Matt and Becca's den, once all our stuff is out of it. I've kept enough here to keep me happily doing some stuff, and to keep going with the long arm business for customers. So very exciting!! I'm a little late posting today, but that's because I actually sat down at my machine this evening and played. We had a whole pile of errands to run this morning and into the afternoon. But I promised myself that, when we got home, I'd have some play time. I have spent so much time in the last few weeks sorting and tossing and organizing, that I'm beginning to finally see the end of it. I can now see the floor underneath my machine. There are just a couple of small containers of fabric left to sort through and I am done. Pretty much everything that is not needed for doing machine quilting is now packed and out of the studio. I have kept back a couple of things to work on, though. I've kept my boxes of 2 1/2 inch strips, my boxes of 2 inch strips and my Grandmothers' choice project. One of the quilts that has been on my want-to-do list for a long time is a 36 patch. Today was the day to start it. I have 5 blocks done already, and fabric pairs chosen for quite a few more. The colours are not as grey as they look here, but the lighting is pretty bad at this time of night. I am really liking what I am seeing so far. I love how easy and how fast these go together. I'm linking this post up to Judy's Patchwork Times. Tomorrow, I can actually get back to doing some customer quilts again, now that I can actually get at the machine. It will feel good to get back at it. I might even have a sneak peak tomorrow. There was a workshop sponsored by the London Friendship Quilters Guild yesterday, that I went to. It began at 9 AM, which meant Gail picked me up at about 20 past 8 AM, a time of day I very rarely ever see. As Gail said, it wasn't pretty, LOL. However, it was worth it, and I had a lot of fun. The workshop was all about making things from selvages, something I've never done before. I don't save selvages, but Charlene was willing to share hers. A lot of the techniques and blocks that Gail and Christine showed, would also be quite suitable for strings and 1 1/2 inch strips, both of which I have in abundance. I came home from the workshop with one thread catcher made from salvages, and the front of a second. That top piece will be filled with beads to give it weight, so that it will sit on the edge of the sewing table and act as a pin cushion. I don't have any beads as yet, so i just sat a heavy bottle on it last night to keep it in place. It has been initiated with threads and snips already. There still hasn't been a whole lot of time for sewing around here. The clean out and reorganization of the contents of the sewing room/studio continues. However, I did spend most of yesterday, between the workshop and the later in the evening doing some fun stuff, so there is a bit of yardage out. I was going to count using inches, rather than point something of a yard, but I've changed my mind. It will be too ponderous and confusing to do that, so I am going back to the decimals. However, I can add the finished units of a leaders and enders project that I've been working on over the past year to my totals, so in spite of not much sewing, the totals are good. Balance: 5.1 more yards out than in. My goal for today is to get the shelving units in my studio all cleaned off and out into the garbage pick up for tomorrow. They are really beat up and ugly, so I don't want them in the new space. Then all the stuff that came off them is either going into boxes, or into new places in my existing room. And I still have a lot of fat quarters, or parts of fat quarters that need to be either put away as fat quarters, or cut into usable units. What a horrendous job this has been, but the end is in sight, and it will all be worth it once it is done. And it will sure make me think more than twice before just tossing fabric into a bin, rather than folding it and putting it away. LOL! I'm linking up to Judy's Patchwork Times and her stash report. and have this weeks' block all cut out, arranged on a flannel board, and ready to sew together. It talks about how exercise for women was actively discouraged as being bad for them. It also talks about something I actually remember, the fight for having girls sporting teams which took place during the 1970's. I might be able to get some time to sew this one together today. We have some errands and running around to do today, including arranging for the purchase of appliances for our new apartment. We've started doing some work on our house here, as well. The main floor powder room has a new vanity in it, and is being painted by Scott as I type this. We also need to pick up stuff for upgrading the main bathroom- a new vanity and sink top and new flooring- and we also need to make arrangements for a new counter top in the kitchen. All of these things are at least 20 years old, and show it. We want to present this house, as much as possible, as move in ready, in order for it to sell quickly, and for the best price we can get. So putting the little extra money and time into it will hopefully pay off. Our wonderful son, Noel, is doing all the work for us here, and will be helping over at the new place as well. I'm linking up to Judy's Patchwork Times for her design wall monday posts. Well, I managed a teeny bit if sewing yesterday. I did up 2 Grandmother's Choice blocks. I have 2 more to do, and then I'll be all caught up, which is one of my January goals. I'm going to change the way I report stash this year. Instead of doing portions of yards, if I've used less than a yard, I'll do inches instead. I'm still going to count as the fabric as used when it is cut for use in a specific quilt, except in the case of my leader and ended projects, which I will count when the tops are ready to assemble.I've been allowing 2 inches of fabric for each of the Grandmother's Choice blocks, some take more and some less, so I've decided on 2 inches as a guideline. Once we get moved into our new place, those added numbers are going to skyrocket. There is a box from Thousands of Bolts already over there, waiting to be unpacked, and there is a package on its way from the Fat Quarter shop. Personally, I think I'm exercising remarkable restraint in not opening them now. LOL! I'm going to link this post up with Judy's Patchwork Times, and then I'm going to see if I can get another block made before heading in to work this afternoon. 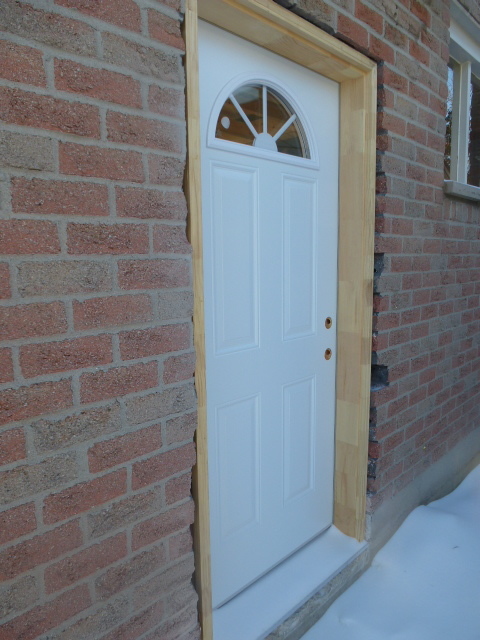 and a new entry door. But a couple of weeks from now we should, hopefully, be almost done. The electrician comes in Monday to wire the long arm studio, and then we can get at putting up the insulation and the dry wall. And then, we will be able to move all my long arm stuff, and I can get back to doing what I love to do - quilting my own and other people's quilts. This is what the entrance to my new space looks like. 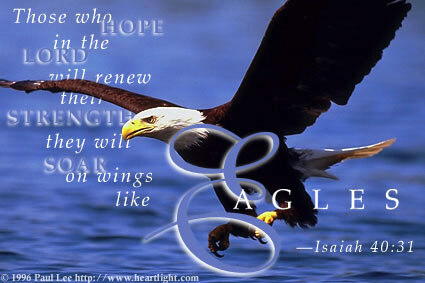 Just a few more weeks, and I can hang a new sign, or something, that says "welcome to Eagle's Wings Quilts". And, I've met one of my January goals. The bin that looked like this a couple of days ago, now looks like this. One goal down, 3 more to go. And I now have a lot more little bitty 1 1/2 inch strips and pieces and a lot more crumbs. This year, rather than hosting a UFO challenge each month, Judy at Patchwork Times is hosting a "getting it done challenge". For last years' UFO challenge, I listed one project per month that I wanted to get finished. I managed half of them. But the other 6 continue to languish in their unfinished states. *sigh*. Some of them, it's because there were too many other things happening, and some are not done simply because there is so much left to do on them that it is overwhelming to think of getting it all done in a month. The idea behind this challenge is to list 4 quilty related things that we want to get done each month. They can be as big or small as we want, which might mean that I can break down the overwhelming projects into smaller bits. So, I think what I'm going to do, is take down the side bar that currently lists my UFOs and replace it with my monthly list, which I can edit, and mark when each goal is accomplished. We are moving this month, sometime, so my goals this month are going to be mostly moving and organization and purging related. 1. Finish sorting through this box and cutting the pieces into usable sizes, strings and crumbs. 2. Sort through this mess and separate out the assorted blocks into their appropriate places, and decided what to do with the orphans. 3. Sort through this box of white and neutrals, discarding the poor quality fabric, and cut the rest into usable sizes. 4. I have to have something sewing related on this list, or I will surely go into withdrawal, so I am going to add keeping up with the Grandmother's Choice Votes for Women block of the week. I'm already 3 blocks behind, but I have them printed, so I just need an hour or 2 and I can get them done. I'm linking up to the Getting it done linky at Patchwork Times. And now, after making my mess public, I really do have to get it done. LOL!! I am cheering myself on by telling myself that I will have so many projects that I can just pick up and do, once everything is all sorted out.